Another interesting thing to note is that although God’s hand is evident throughout the story of Esther, and although God is the main character in this narrative, His name is never mentioned in the book. This chapter puts a spotlight on pride as Xerxes wines and dines his friends to prove his majesty and power. Unfortunately, pride leads to the destruction of his marriage. In my opinion, whether Vashti was justified or not in her decision is based on speculation. Some would say that the king was drunk and wanted to parade her for his guests. Perhaps that is true, and she may very well have been wise not to go. Either way, there’s a bigger picture we need to address—the providence of God at work in their lives. Keep your eyes open for the providence of God as we move through this story. What often appears as coincidence is God directing their lives. In this chapter we read about three feasts. Two were hosted by King Ahasuerus himself. How long was the first one? How long was the second one? The first one was six months, followed by a week long feast. It was held in the garden courtyard of the King’s palace. There were white, green, and blue, hangings, fastened with cords of fine linen and purple to silver rings and pillars of marble, upon a pavement of red, and blue, and white, and black, marble. Royal wine in abundance was served in gold vessels. Each vessel differed from the other. Each guest was allowed to drink as much as they wanted. Couches (also referred to as beds) were of gold and silver. It was common in those days for guests to recline on a couch at a feast. 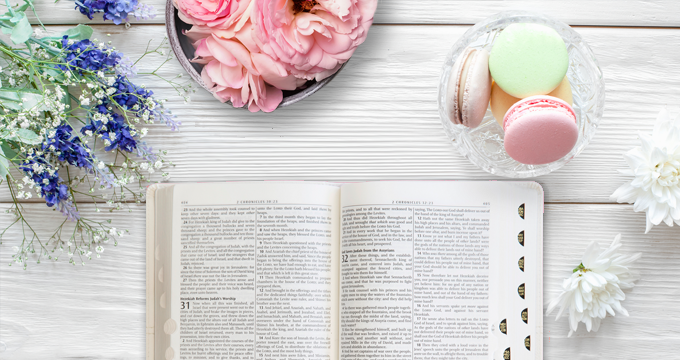 According to verses 4 and 11, what was the purpose of his feast? What might this reveal about his character? The King held the feast to display his wealth and the glory of his majesty. To give you an example of his temper and personality, the historian Herodotus (7.35) wrote that Xerxes was once so angry at the sea that he instructed his men to give the sea three hundred lashes as they shouted at the water. What we see from chapter one is that the King had both a temper and an abundance of pride. Why was the king angry? The king called his wife, Vashti to his banquet. He wanted to display her beauty to his people, and so he sent seven eunuchs to bring her to him, but Vashti refused to go. Although one can only speculate as to why Queen Vashti didn’t answer the King’s call, we do know that her decision resulted in a severe consequence. What was that? Her royal position was taken away, to be replaced by another. She was also banned from ever entering the king’s presence. What ripple effect did her choice have? In fear that Vashti’s decision might be an example that others would follow, a proclamation went out that every man would rule over his household and that every woman would respect her husband. 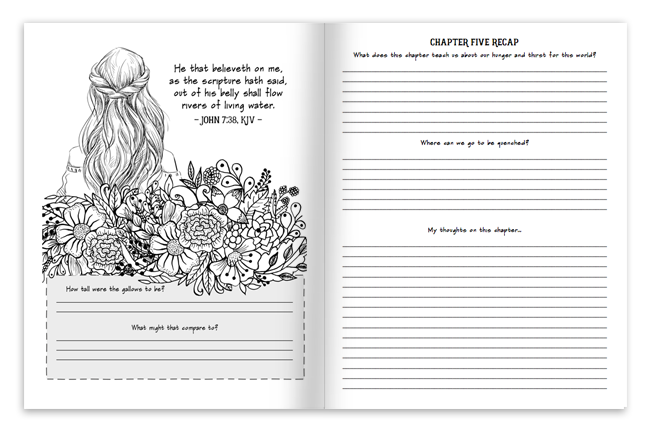 Another ripple effect was that Vashti’s exit opened a door to Esther’s entrance, which we’ll read about in our next study! The timeline of events in the book of Esther take place between the 6th and 7th chapter of Ezra. In fact Mordecai’s name is mentioned in Ezra chapter 2:2. (Transations of the Chronological Institude of London Pg. 82) And so Ezra is the perfect book to read alongside Esther as it gives us a deeper understanding of the Jews at that time. According to the ancient historian Josephus, there were 400 virgins competing for the title. This is also something I found interesting. Part of the purification process was a six-month treatment with the oil of Myrrh. I got to wondering what significance if any Myrrh had. I discovered that Myrrh comes from the Commiphoa Myrra tree. The interesting thing about Myrrh is the way that it’s extracted. The tree is pierced and the Myrrh bleeds out of the tree in droplets. Many Christian historians believe that this symbolizes the suffering of Christ. To me this added to the story as I looked at Esther’s purification process to be a parallel to the Christian life as we are guided by the Holy Spirit. Part of our purification process is partaking in the suffering of Christ as we become a living sacrifice. This purification refines us and beautifies a believer as we grow to be more Christ-like. What did the king’s attendants suggest? That a search would be made for a beautiful young virgin to replace Queen Vashti. Whose care would the women be under? Mordecai’s family had been taken into exile by Nebuchadnezzar. They were brought from Jerusalem to Palestine. At that time, Nebuchadnezzar and his men broke the walls of Jerusalem and destroyed Solomon’s temple. 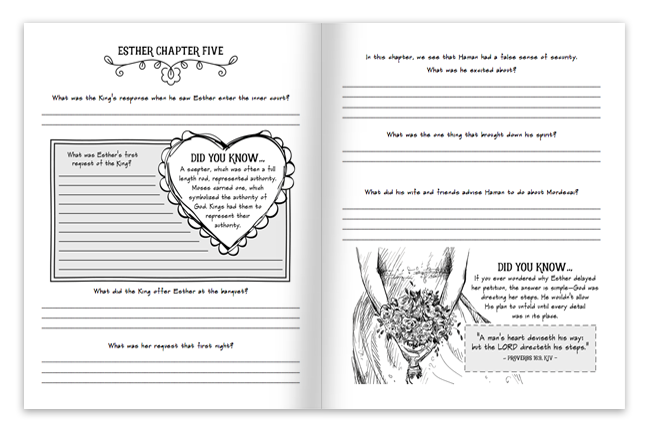 What was Esther’s original name? Hadassah which means compassion. It was changed to Esther which means star. What was Mordecai’s relationship to Esther? They were cousins. She was the daughter of his uncle Abihail. Since Esther’s parents had died, Mordecai looked after her like she was his own daughter. What special treatment did Hegai give Esther? Esther won Hegai’s favor, and so he was quick to provide her with cosmetics and food. She was assigned 7 women, and they were assigned the best rooms in the harem. What preparations did the women have to go through before they could see the king? There were 12 months of beauty treatments: six months with oil of myrrh, and six with perfumes and cosmetics. What was the plan for each woman who went before the king? They were allowed to take anything from the harem with them. They would go to the king in the evening, and then return to another part of the harem in the morning, under the care of Shaashgaz. Shaashgaz was in charge of the concubines. The women would not see the king again, unless he called for them by name. Esther’s approach was different from the others? Can you see a parallel here to the Christian life? I often see Hagai as a symbol of the Holy Spirit in our lives. 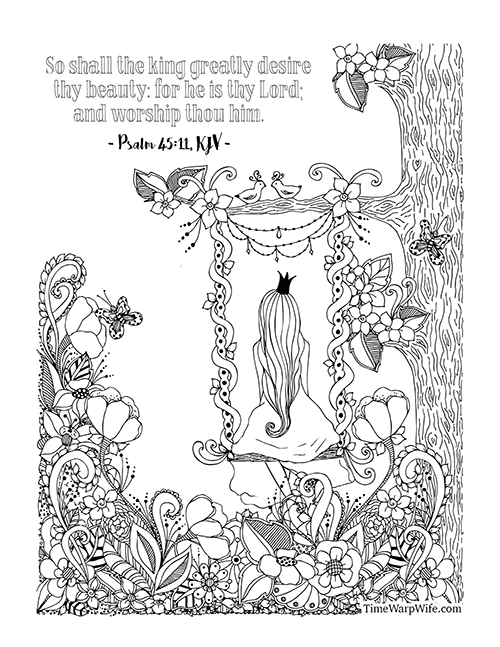 He was appointed to guide her, care for her, instruct her, feed her, and beautify her. He would lead her through the purification process until she was ready to meet the King. While Esther could have brought anything with her, she only brought what Hagai instructed her to bring. As we prepare for the King, the Spirit guides us in knowledge and truth. Throughout the book of Esther, we see the providence of God. What is the definition of “providence” according to the dictionary? 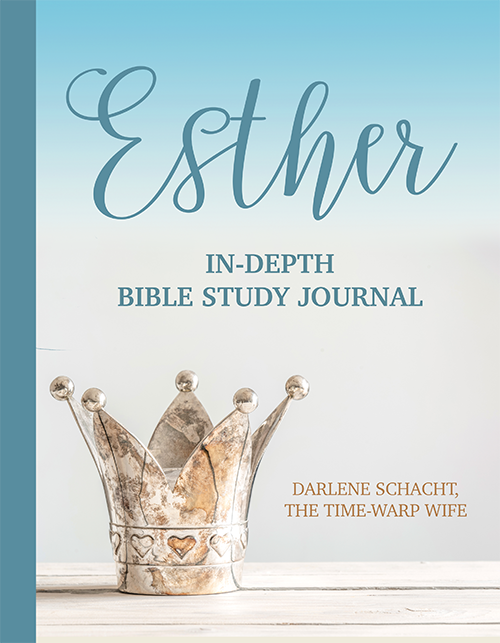 How much time has passed since the beginning of chapter one, and the day that Esther was taken to the king? She was taken on the tenth month, seventh year. The story started in the third year. And so four years have passed. How did Mordecai save the king’s life? Mordecai sat at the Kings gate. It was there that he heard a plan between Bigthan and Teresh, two of the king’s chamberlains, to kill king Ahaseurus. Mordecai informed Esther who reported it to the King, giving credit to Mordecai. Note: at this time, the King was not aware of Esther’s connection to Mordecai or her heritage. There are several theories out there as to why Mordecai would not bow to Haman. One possible explanation is that Haman was a descendant of King Agag of the Amalekites. The Amalekites were the first army to attack the Israelites after their escape from Egypt. In Exodus 17, the Lord swore that He would have a war with Amelek from generation to generation. The word “pur” that we see in verse 7 refers to an ancient tool used for the purpose of making decisions. The lot was most likely a type of dice that was cast to determine the date. The feast of Purim, which we’ll read about later in this study, is a celebration of their defeat over Haman’s plot to destroy them. Who did the king promote? Haman son of Hammedatha, the Agagite. He was given a seat of honor higher than the nobles. Why was Haman angry with Mordecai? The King had commanded the people to bow down and honor Haman, but Mordecai would not kneel down and honor Haman as the others did. Day after day Mordecai was instructed to honor him, but still he refused. The king’s officials reported this to Haman and informed Haman that Mordecai was a Jew. What revenge was Haman plotting? Instead of simply taking his revenge out on Mordecai, Haman decided to destroy all of the Jews in the kingdom. How much time has past from the beginning of chapter one? The story started in the third year, and this is now the 12th year, in the first month. So nine years have passed since this story began. Esther went in to see the king in the seventh year, and so she has been with the King now for five years. What date did the lot fall on? The thirteenth day of the twelfth month, the month of Adar. What did Haman ask of the king? And what did Haman offer him? Haman asked that a decree would be sent out to destroy all of the Jews. He said that these people didn’t obey the king’s laws and therefore it was in the king’s best interest to have them destroyed. Haman offered the king, ten thousand talents[b] of silver for the administrators for the royal treasury. Who was Haman planning to annihilate, and when? All of the Jews in the kingdom on the thirteenth day of the twelfth month, which is Adar. I have been struggling for months to find my desire to pick up the Bible and read and learn. I purchased the journal for this study since it wasn’t very expensive and the timeframe was 3 weeks, hopefully something I could commit to. I got alot more than I was hoping for. I have a hard time reading and comprehending without being in a group… your study journal makes me look back and think and expands on my answers alone. I look forward to more studies in the future. Thanks so much! I have missed this study so far. Will I be able to pick it up and do it now. I am a week behind, but I am catching up. I am enjoying seeing God’s plan playing out and using Esther, Mordecai, the king and many more. I haven’t done a bible study in years. 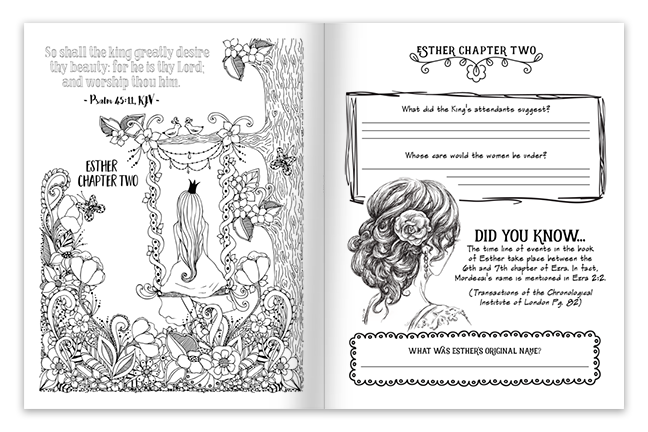 I am really enjoying digging into Esther. How many weeks or sessions are there in this study of i buy the book?